Rental prices for strollers and Electronic Convenience Vehicles (ECVs) jumped yesterday. 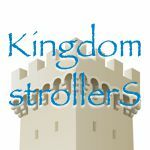 Single strollers are up 50 percent from $10 per day to $15 per day, while double strollers are up a whopping 72 percent, from $18 to $31. ECVs are up from $35 to $45, though the deposit is up from $5 to $20. “Length-of-stay” stroller rentals are also up similarly, with singles increasing from $8 to $13 per day and doubles up from $16 to $27. These price hikes seem steep (and they are! ), but bear in mind that there has been no increase in these fees for three years.